Weed barrier? Landscape fabric is more like a healthy plant barrier. 11-4-14 – Welcome back, Renegade Gardeners around the globe! This creaking, wheezing and occasionally belching old website has hereby been yanked from its summer slumber and is ready once again to enlighten, entertain, and infuriate with new updates each month now through May, 2015. In addition to this month’s new Current Column, which you have already begun reading, you will also find new, lengthy updates on a wide variety of gardening topics under the Plant Spotlight, Top Pick, Myth of the Week and Don’t DO That buttons to your left. So if you’re already up to speed on the terrors of landscape fabric, skip this, and start clicking the buttons. 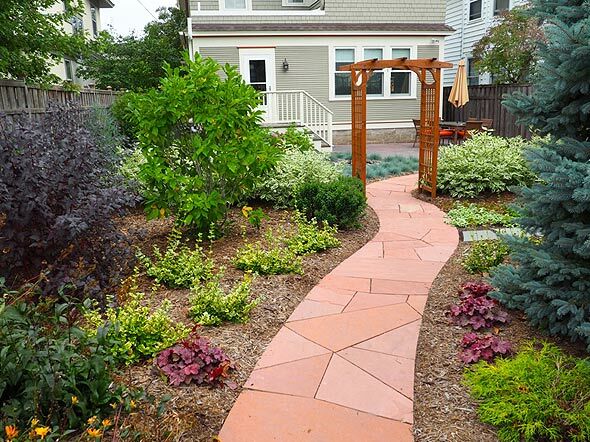 I’ll take care of you next month with an all-new landscape design column. Ah, landscape fabric. I’ve covered this topic before, but this site is huge, new readers stumble across it every day, there’s no search engine, and there are some things you can’t make fun of often enough. Except it’s no longer fun. This summer during my landscaping season was the last straw. I don’t think my company did a single landscape renovation job this summer that didn’t involve landscape rock removal (don’t get me started). Underneath the rock, of course, is the black mesh fabric that some undereducated previous landscaper had installed. Whether it’s covered with rock mulch, wood chips or any other form of organic mulch, landscape fabric (sometimes called “weed barrier fabric”) is torture, for the soil, the plants, the gardeners forced to live with it, and the poor unfortunate landscapers who have to try to save a landscape over which it was erroneously cast. Roll it out across every inch of soil in the planting beds, cut holes where the trees and shrubs and perennials are to be planted, plant them, and voila – an eternal landscape in which no plant will ever die, nothing will ever need to be moved, nothing added, and perennials certainly never dug up, divided and replanted. Yeah, right. We did do one job that included removing landscape fabric from underneath a large bed of spruce trees that had been mulched with small bark wood chips, repeatedly over the years, in addition to the wonderful, natural organic blanket of dead spruce needles and decaying cones. The first thing we had to do was weed it, since weeds had grown on top of the fabric throughout the entire bed. Here’s the fabric we’re pulling up around a bed of suffering spruce trees. Then we raked and shoveled all the organic mulch off the top – a solid five inches of the most beautifully rich, dark, composted organic material you’ve ever seen. Underneath was the fabric, held with long metal staples and still in good shape, since the stuff will hold up and do its dirty work for generations. Even folded, section after section of four-foot wide fabric nearly filled the back of my pickup. Landscape fabric serves no positive purpose. If it’s there to keep rock mulch from settling into the soil over time, you should never mulch with rock in the first place. When it is placed on the soil and covered with organic mulch, it stops the mulch from doing what it’s supposed to do: slowly break down, be absorbed into the soil, and replenish the nutrients. 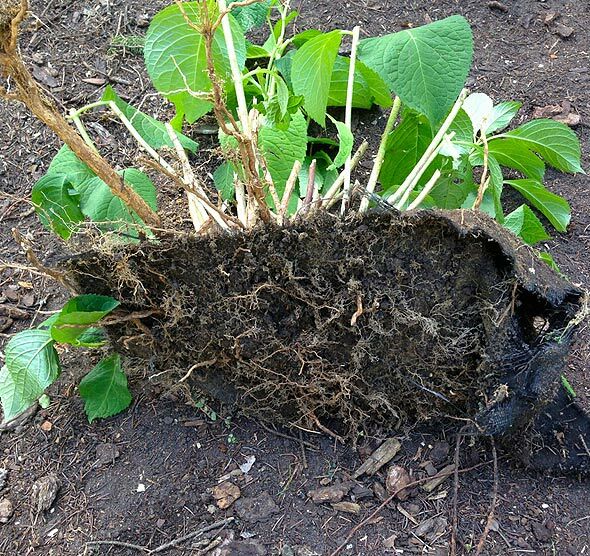 Shrubs and perennials that expand slowly at the base, such as the Hydrangea in the first picture, have no choice but to root on TOP of the fabric, gallantly attempting to send roots through the fabric into the soil beneath. 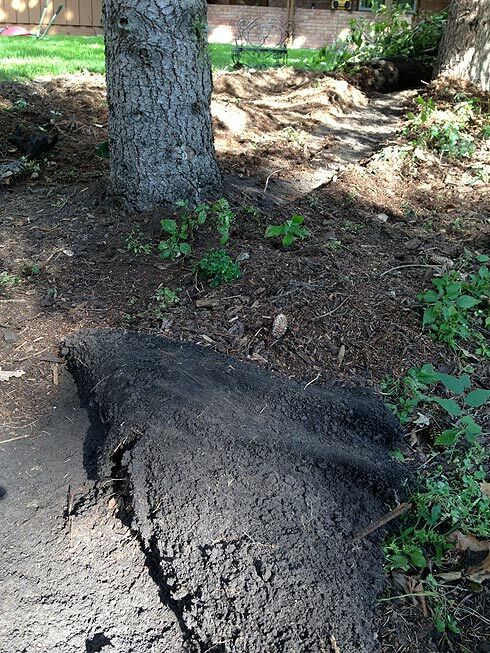 Though porous, landscape fabric allows neither water nor oxygen to enter the soil as readily as if it weren’t there. Underneath landscape fabric, the soil is always dead or dying – healthy microbe activity is compromised – and it’s completely dead under black plastic. A two- to three-inch layer of organic mulch – compost, shredded bark, shredded leaves, dried grass clippings – do a perfect job of blocking out the sun from germinating weed seeds near the surface of the soil. Some weeds will always grow on top of organic mulch, they’re wind-blown, and will grow whether landscape fabric is down there somewhere or not. You see them, you pull them, they’re gone. Next month’s update will focus on landscape design, centered around a neat St. Paul job we did last fall that is starting to rev its engine. It should offer numerous ideas for homeowners who are sick of grass and trying to figure out how to landscape a small back yard city lot (Hint: garden rooms).